If you’ve ever dreamed of getting married on the beach, barefoot at sunset with a steel drum band playing in the background — you’ve found your destination. 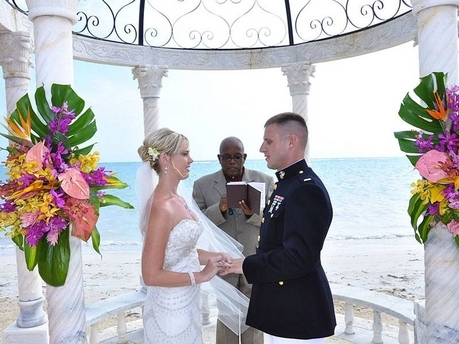 Whether you choose to get married in the Bahamas or Barbados, each Caribbean island has its own distinct personality. If old world charm is what you’re after, try a historic hotel in the center of Old San Juan. If you prefer the secluded romance of a quiet island — investigate some of the less-traveled spots on St. Baarts or Grenada. When choosing your date, avoid hurricane season — the period between June 1 and November 30 (unless your island is below the hurricane belt, as Aruba is). Plan early if you want to wed over a long weekend. Each island has its own set of legal requirements, so check with your specific island’s tourism board, or hire a local wedding planner who can guide you through all the red tape. The U.S. Virgin islands and Puerto Rico tend to be the most hassle-free. Necessary documents: Driver’s licenses or passports; proof of divorce or death certificate of former spouse/s (if applicable); letter accompanying application for marriage stating date of visit, length of stay, and preferred wedding date if having ceremony performed by a judgeNote: Application must be received at least 2 weeks prior to wedding. Note: Two witnesses over the age of 21 must be present and blood tests are required, although a test conducted in the U.S. mainland within 10 days of the ceremony will suffice. A doctor in Puerto Rico must sign the license. Note: Requests must be made 14 days in advance. You must be at least 21 years of age to marry in St. Maarten and divorced women may not marry until 306 days have passed since getting their divorce finalized. The French side of the island, St. Martin, has prohibitive residency requirements. Note: Publishing bans may be necessary for church weddings. Make plans with appropriate clergy. Necessary documents: Passports; birth certificates; proof of divorce or death certificate of former spouse/s (if applicable); declaration certifying both parties are unmarried U.S. citizens, sworn before a U.S. Consul at the American Embassy in Nassau; a marriage license from the Commissioner’s Office on other islands; proof of arrival in the Islands of the Bahamas. Note: Both parties must apply in person. Note: Both parties must apply in person at the Ministry of Home Affairs in Cheapside, Bridgetown. Necessary documents: Passports and a “Notice of Intended Marriage” form from Bermuda’s Registrar General’s Office. The form is available by phone request or at http://www.bermudatourism.com. Fill it out and mail it along with a cashier’s check or bank draft made payable to the Accountant General, Hamilton, Bermuda, in the amount of US$210 back to the Registrar General. Your license will be valid for three months and can be picked up at the Registrar’s office by you or a designated person. Note: “Notice of Intended Marriage” must be filed 2 weeks before the wedding.